So we had two months to get everything together, I was charged with finding a venue and Kay rang all the people we had numbers for and e-mailed Ruth who was flitting around the country visiting various relative and friends; we knew where nine of us had ended up. Kath had emigrated to New Zealand in 1979 but on a long shot Kay e-mailed her on the off chance that she was coming to the UK before Ruth went back to Zambia. Sadly, Ped died suddenly some years ago but we had no news of the other five, Brenda, of course had left after a year but we only had old home addresses for Kate, Ali, Pat and Hazel. Kay contacted Ralph, Ped’s husband for an update on her family and wrote letters to the old addresses hoping someone who lived there might know something. We got very excited when Kay was contacted by someone in Ali’s old address and promised to try and track her relatives down; but we had nothing from anyone else. Meanwhile I was trying to find a suitable venue; we had decided that somewhere in the middle of the country would be the fairest for people having to travel from all ends of the country. I first tried Grantham, near to trains and motorways but the only one suitable was way over budget for many of us so Nottingham was next choice and to avoid the city centre, plumped for a Holiday Inn just off the M1. With three weeks to go, the numbers had been finalised; Kath wasn’t going to be in the UK; Ann had had a stroke in October 2007 so didn’t feel able to make the journey and Jasia had been diagnosed with breast cancer and was to undergo surgery on September 23rd, so that left six of us. Knowing how easy it is to just talk randomly Kay and I felt it would be an idea for everyone to do a summary of their lives over last 43 years which could be presented to the group. Kay then did an agenda which she sent to everyone and asked those who couldn’t make it to do a resume for us to read out. In a leap of faith I had booked six rooms without knowing that the Holiday Inn would have a suitable place for us to have a meeting so my next job was to make a visit and check it out. Lucky I did, the road had been neatly bisected by the M1 and my sat nav first took me to the wrong half and I ended up in a Novotel. Thankfully, when I did get to the right place, I found that they had a very nice lounge area and I mentally marked out a corner that we would be able to sit in private. So all was set; alas news of Ali wasn’t positive, someone who knew someone said she was in Spain but we didn’t know if that was permanent or just a holiday; Kay had an e-mail from Kate’s sister-in-law who told us Kate was in New Zealand but nothing from Pat or Hazel. Still after 43 years I guess six out of fifteen is not too bad. So now I’ve got to have a new blog! You’d think those techie people would consider those of us who are over 21 and not keep changing the software. I am assured,(by those who profess to know), that I will find this format even easier to use than my old webmac. It’s been doubly irritating not to be able to blog anything about our old girls reunion so I’ve decided I will do it retrospectively and hope I can remember some of the problems we encountered in getting to it off the ground. 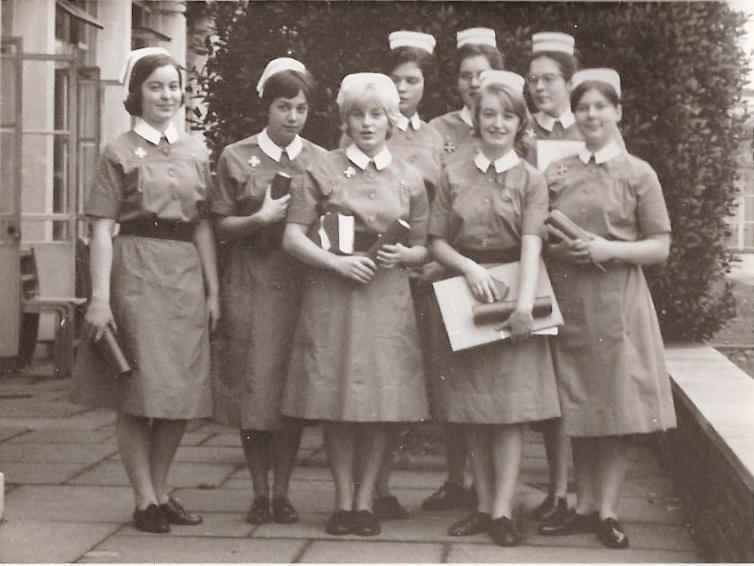 So here we are in 1964, newly qualified SRN’s ready to leave Hammersmith Hospital behind. Actually there are a few of us missing; we started out in 1961, the Integrated Nurse as a group of 15. Brenda decided nursing wasn’t for her after all and left us after the first year and I’ll try and remember what happened to the rest. Kate & Ali left in our third year, Kath (now Kathy) left after Finals Ann and Ped had to retake their final exams three months later with Ruth who had had too much sick leave. Anyway, we spent a further year getting our District Nurse and Health Visitor qualifications until we all went our separate ways in the summer of 1965. Kay (now Kath) tried to get us all together a few years ago but I guess we were all too busy doing out own thing as she didn’t get much interest from anyone. Now we are all 43 years older, maybe wiser and with a whole range of life experiences between us, so it seemed a good idea to try again. This time we had time constraints because Ruth who works in Zambia was home on leave until the end of October; this acted as a great catalyst which helped to concentrate our minds and get things organised. October 9th 2008, was the chosen date and two months to arrange a venue and contact everyone we could find.